Most busy Manhattanites don’t have the luxury to take a leisurely lunch break at Eleven Madison Park—AKA the “world’s best restaurant.” The next best thing just might be the restaurant group’s new fast-casual eatery, Made Nice. A sampling of the delish menu options: salmon rosti—which is a frisée salad made with smoked salmon, a soft-boiled egg, dill-caper relish, cucumbers, and potato croutons—and cauliflower stew, made with tofu, couscous, coconut, lemongrass, watercress, almonds, and grapes. Hungry yet? Clearly the refrigerators at Made Nice are stocked full of veggie and protein options. And it turns out the eatery’s chef, Danny DiStefano—also known as Chef Danny—has a similar inventory at home. Freshly caught fish, vegetables straight from the garden, and plenty of wine take center shelf in his well-stocked fridge. Want to get a closer look? 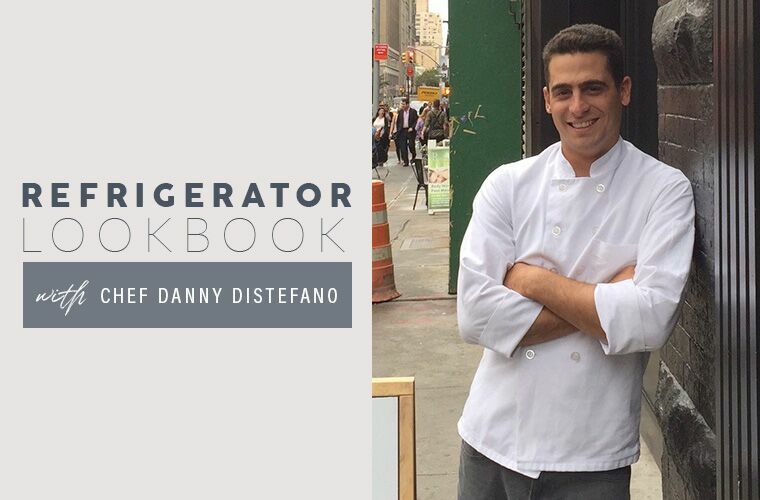 Scroll down for a peek into Chef Danny’s fridge. That’s one good-looking fish you’ve got in there. I just bought a boat and I’ve always been a fisherman. I live right on [Long Island’s] Great South Bay, and Saturday morning I was out on the boat and caught this little fluke. It was a good ceviche in the afternoon. Next to it are some flowering oregano and thyme from the little garden in my backyard. Herbs are always a staple. You’re going all out with your mozzarella. In that bag is an imported buffalo milk mozzarella. It goes quick whenever there’s tomatoes around! And you’re clearly a coffee drinker. I just got turned on to La Colombe’s bottled draft lattes. I tend to drink hot coffee in the morning, but when those are around, they are almost like dessert. There’s one with coconut milk, another with almond, a mocha flavor…They’re so good. I spy some Siggi’s yogurt in there, too. Is that your go-to breakfast? It is! I add in some of the Made Nice granola, which I keep a bag of at home, and that’s breakfast. I actually grew all of those in my garden. I like to make tomato salad with raw zucchini and peppers. I typically always have my veggies raw, with the exception of the eggplant, of course. For me, tomato and mozzarella have always been a favorite. It’s easy to get everything from the garden and just chop it up. You must be very well-hydrated. I’m typically more of a sparkling water person. The Pellegrino is my go-to. But I drink a couple bottles of water when I wake up and right before I go to sleep. That’s what keeps me going. I also see some Sriracha in there. Do you like a little bit of a kick? I do. I have a couple hot sauces in there. The one right next to the Sriracha is my favorite. It’s a fermented pepper sauce. I definitely like some spice! If you like sparkling water as much as Chef Danny, check out this recipe for a lavender-infused adaptogenic one. And you’ve heard about LaCroix’s latest flavor, right?